No Big Bird jokes, I promise. Who? The Fighting Blue Hens of Delaware. Yes, even the men. I have the mental image of a guy from Delaware and a woman from South Carolina sharing a drink in poultry confusion solidarity. Where? Newark, Delaware, once home to the United States’ oldest paper mill. When? March 17th, in Upper Marlboro, Maryland. Why? They won the Colonial Athletic Association conference tournament. How? 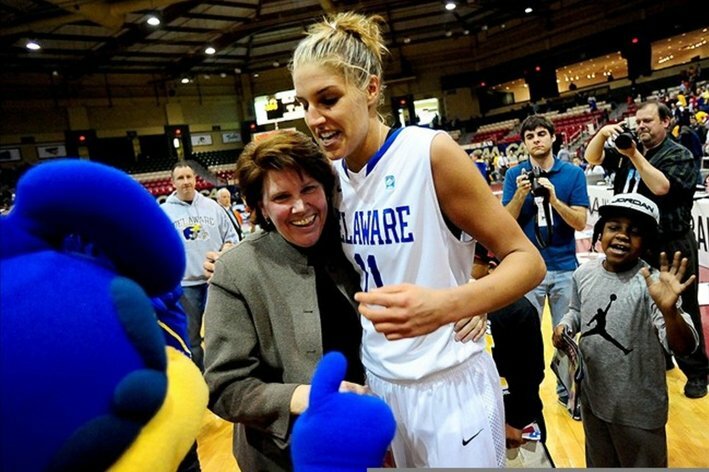 Delaware withstood several Drexel runs and took the CAA tourney title behind 28 points from Elena Delle Donne, 59-56. Surprise? Predicted to finish first in the conference, they finished first and undefeated in the CAA, three games ahead of James Madison. Bad losses: Georgetown and at Duquesne, but both without Delle Donne. Who’s running this show? Tina Martin, since 1996. An assistant at Seton Hall when Seton Hall was actually really good. That’s a while. Extra, Extra! The Wilmington News Journal. It would be simple just to say “Elena Delle Donne” and walk away to work on another team. And Delle Donne is the key for this team: 25.2 points and 8.7 rebounds per game, 50.2% shooting from the field, 48% from beyond the arc, and 92.4% from the free throw line, a 2:1 A/TO, over 2 blocks per game. But senior guard Lauren Carra is also a threat, putting up 11.3 points per game, and senior point guard Kayla Miller runs a steady offense. Stopping Delle Donne, if such a thing is possible, is the key to stopping the Blue Hens- but there are players capable of stepping up. Next Post When cockfighting is outlawed, only the outlaws will be cockfighting.